A Cooker's employee prepares for the shop's recent open house. Vintage VW owners from around the Mid-Atlantic region bring their vehicles back to the Williamsport, Md., shop once a year. Owner Bob Cook says he started paying attention to cars at an early age and was doing full restorations by the time he was 19. His day job was building houses, but he would come home and work into the night on old VWs. 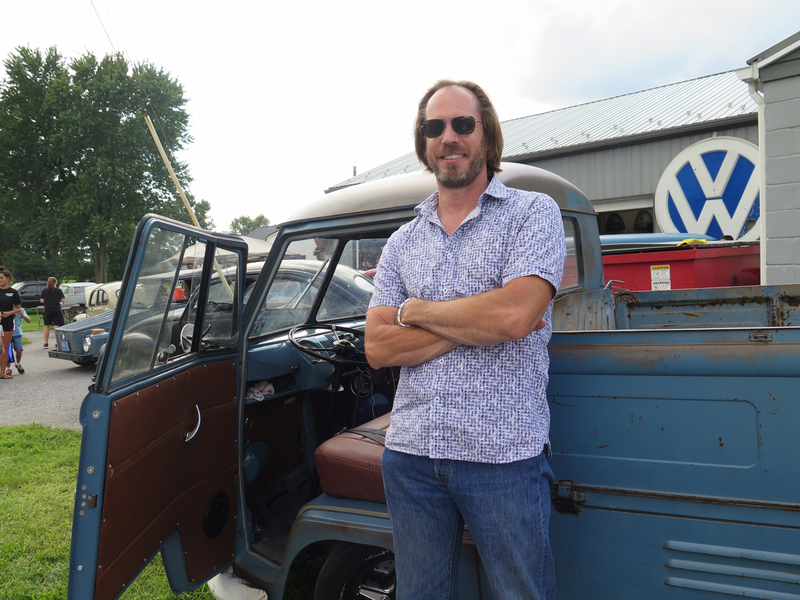 When the housing market collapsed in 2009, he bought this little shop in Williamsport and started restoring VWs full time. Word of the shop's artistry spread, and now he has a 2-year-long list of vintage VW owners waiting for him and his small crew to work their magic. That magic was on display recently at Cooker's annual open house. In front of the shop, satisfied clients and VW fans mingled and admired perfectly restored cars. One gem is a midnight blue 1964 Beetle owned by Georgine Casper, from Edison, N.J.
Casper's love of VWs goes back to her teenage years in the late 1970s. "I actually had auto mechanics in high school," Casper says. Her then-boyfriend Mike, now her husband, had a VW bug back then. "I always admired Volkswagens," Casper says. "His brother had one. He had a '65. You know, in the winter, when it didn't start, I'd be the one out pushing it. And I said, 'I want a Volkswagen.' My mother said, 'You don't need a Volkswagen.' I said, 'I want a Volkswagen.' 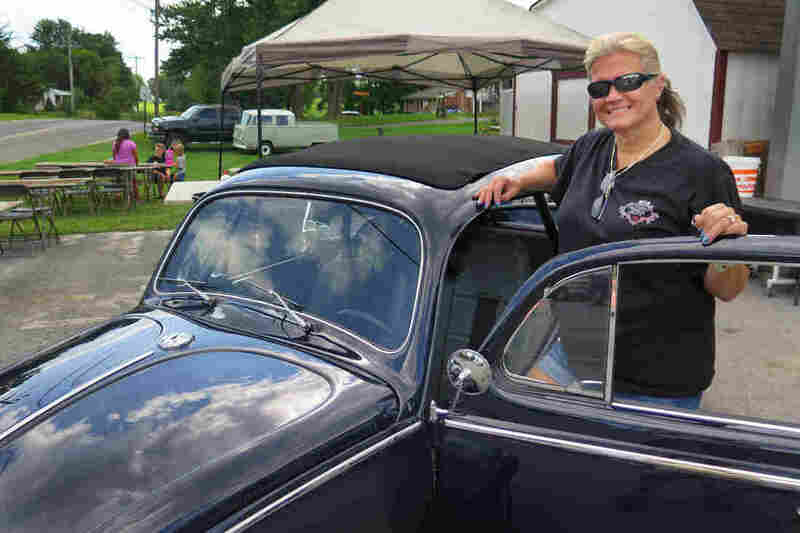 "
Georgine Casper, whose love affair with Volkswagen Beetles started in high school, shows off her fully restored 1964 model. So she bought two, the midnight blue '64 and a 1969 Beetle for $600. She says the floorboard on the '69 was so rotten that you could almost put your feet out through the bottom. Her mother was not pleased. "She looked at the two of them. She was like, 'Oh my god, what did you do? You spent your money on these junks. This is not Sanford and Son's junkyard,' " Casper says. "She was like yelling, and everyday, she'd come home and say, 'Look at this junk.' And I'm like, 'It's not junk.' Because to me, it wasn't. It was a diamond in the rough." Ultimately, Casper, who became an office manager, not a mechanic, couldn't do the restoration herself. So she asked Cook and his crew to make her dreams for her car come true. Now Casper's '64 Beetle shines like a diamond with four chrome wheels as the setting. To make this happen, Cook and his crew take the cars apart and restore them piece by piece, either to their original condition or to a modified version. Casper's car is an understated hot rod with a high-powered engine and roll cage. 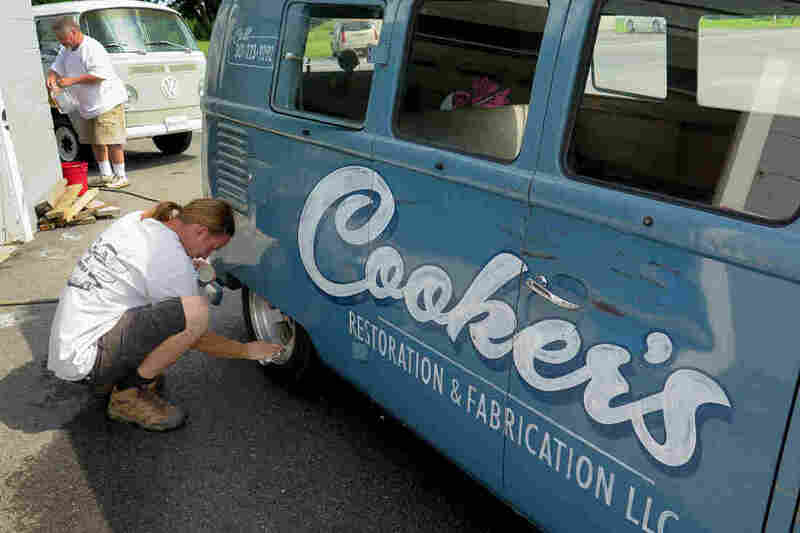 The other specialty of Cooker's is restoring vintage VW buses, like Alvin Ziminsky's. He brought his to Cooker's from Cherrytown, Pa. "I found it in a barn near Frederick, Md., in '95. Paid $100 for it." "It was like $2,600 new in 1964," he says. Asked what his $100 purchase might be worth today, Ziminsky says, "Probably nearing $150,000." Alvin Ziminsky owns this 1964 21-window deluxe bus. He says his $100 investment in 1995 could be worth almost $150,000 now that it has been restored. 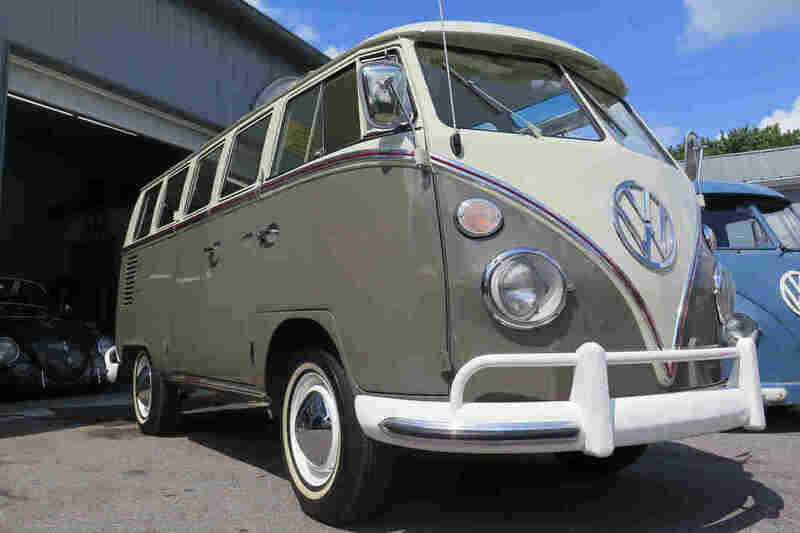 In just the past few years, the market for vintage VW buses has skyrocketed. Rusted-out buses that people used to pay to have hauled away now sell for $20,000 or more. Why are they in such demand? Partly, it's just their great design and simplicity. And partly, it's the stories that go with them, Ziminsky says. "You can't go anywhere without getting stopped and talked to," he says. "You're on the road, people almost crashing into you, trying to take pictures. I got scared because people were like driving with one hand and snapping pictures while they were beside me." David Abruzzi has a story, too. It's attached to his 1960 VW Single Cab that is part VW bus and part pickup. Abruzzi drove it to the open house from Paw Paw, W.Va. The pickup belonged to his grandfather, who used it on his farm in North Dakota in the 1960s. "He died in 1974. It was pulled into a barn, and it sat there until 1987," Abruzzi says. "I went up and, with the help of a great uncle, got it running and drove it all the way back to New Mexico." It sat for 27 years in the New Mexico sun until Abruzzi brought it to West Virginia, where he lives now. "People were stopping by my house and said, 'If you're going to restore it, you've got to take it to Cooker's,' " he says. David Abruzzi's ride is a rare Single Cab. The sides in the back fold down so it can be used as a pickup or a flatbed truck. Abruzzi says he has a vivid memory of something that happened one day when the truck was being used to haul sod. "I thought it would be fun to get up in the bed and throw pieces of sod on [my grandfather's] back," Abruzzi says. "He says, 'If you do that again, you're going to get a whuppin'. And you know, being a 5-year-old and that's your grandpa, what do you do? You do it again. I do not remember the spanking, but I remember my grandma making him apologize to me because it's not the thing a grandpa ever does." Cooker's repaired the rusted spots on the old pickup, matching the original faded blue paint that covers 80 percent of the vehicle. It's more valuable with the original paint on it. But, for Abruzzi, the truck's monetary value isn't the point. What's priceless for him is his grandfather's name and address still stenciled on the doors: W.E. 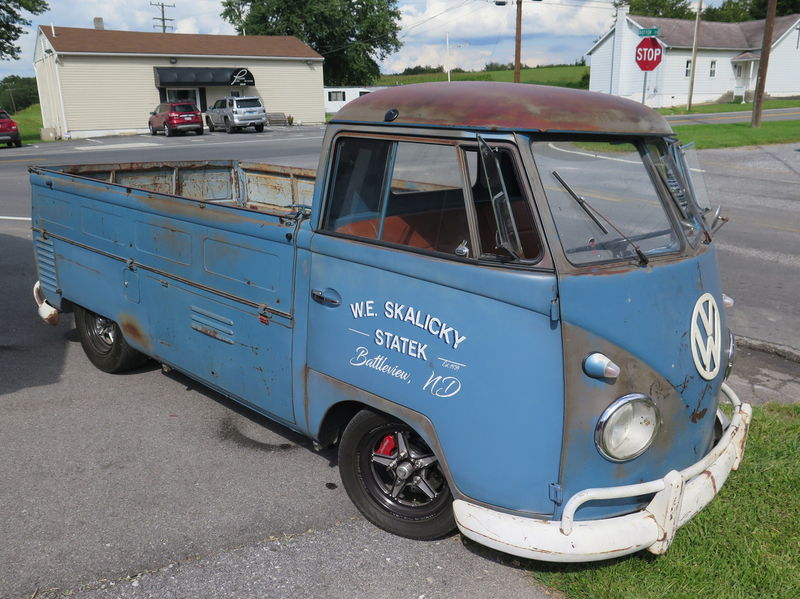 Skalicky, Battleview, N.D.
Abruzzi's 1960 VW Single Cab belonged to his grandfather and has been in his family since about 1965. He says he doesn't think he could ever part with it. He likes to take it out about once a week. "It just makes people smile," he says. NPR's Les Cook contributed to this report.